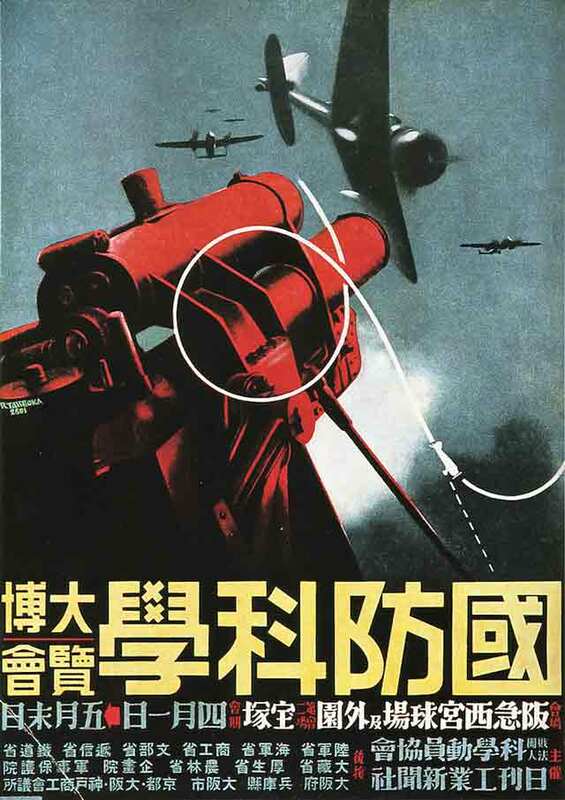 During World War II, all of the major powers assembled a gallery of propaganda posters. 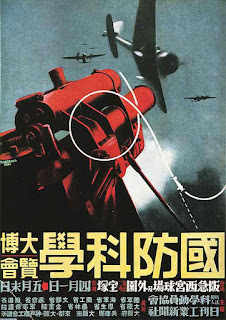 Japanese propaganda posters of World War II are distinguished by their artistic quality and their lack of coherent messages. 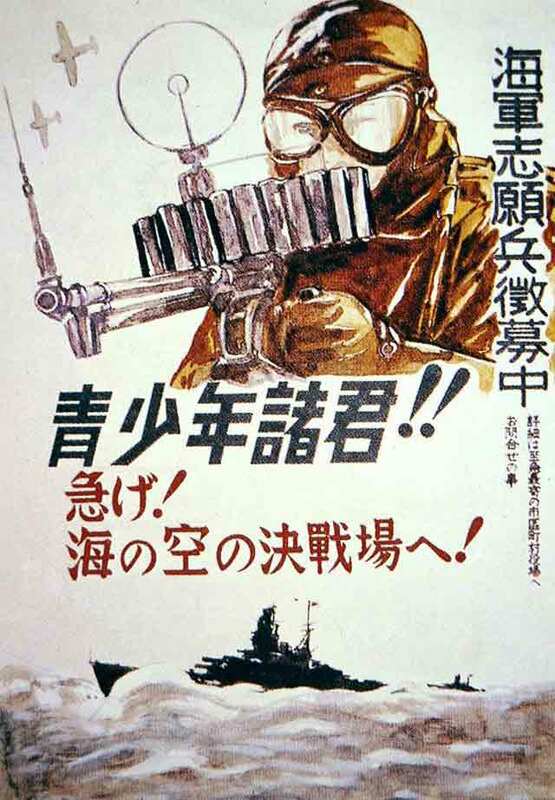 The Japanese propaganda posters do not try to tell people how to act or how to feel, they don't ask men to enlist, they don't tell people to Keep Calm and Carry On. 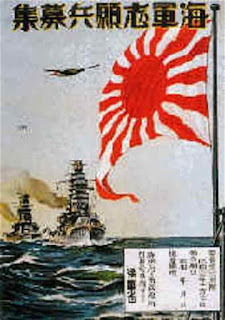 Rather, the Japanese posters portray symbols of national pride and commitment. 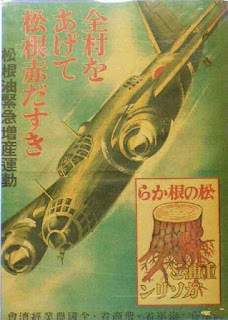 Apparently, and probably quite correctly, the authorities believed that the Japanese people already were completely committed. This was not a bad assumption, as Japan easily was the most homogeneous of the major powers during the war, and absolute loyalty of its citizens was pretty much a given. 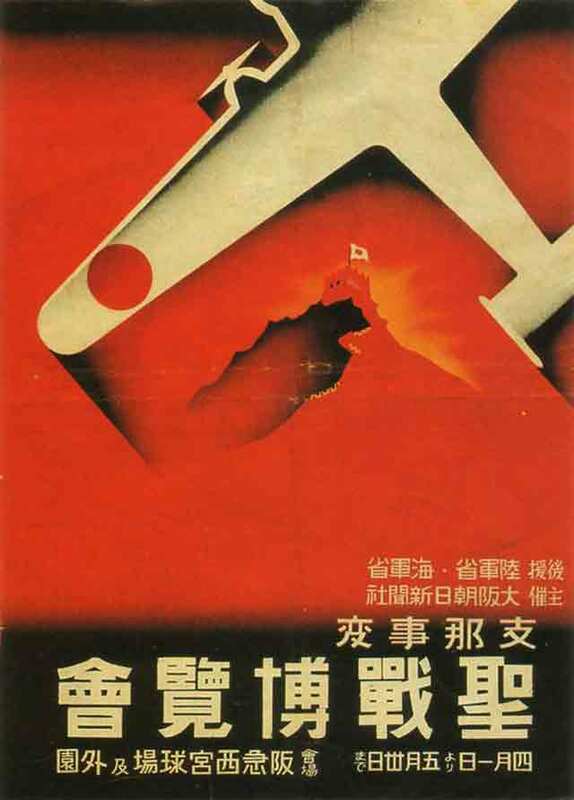 Japan had a slight problem when crafting its posters. 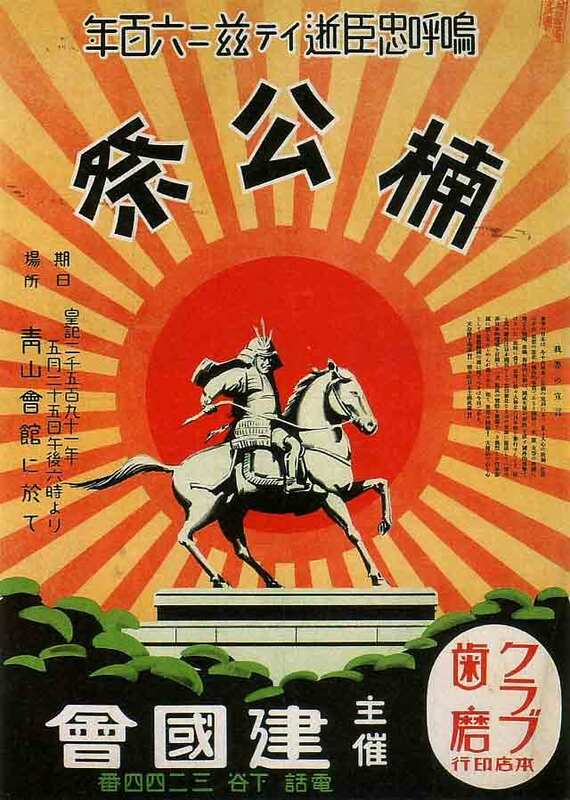 Emperor Hirohito generally was not portrayed in posters. He was considered a deity, and his divine presence could not be sullied by crude caricatures. 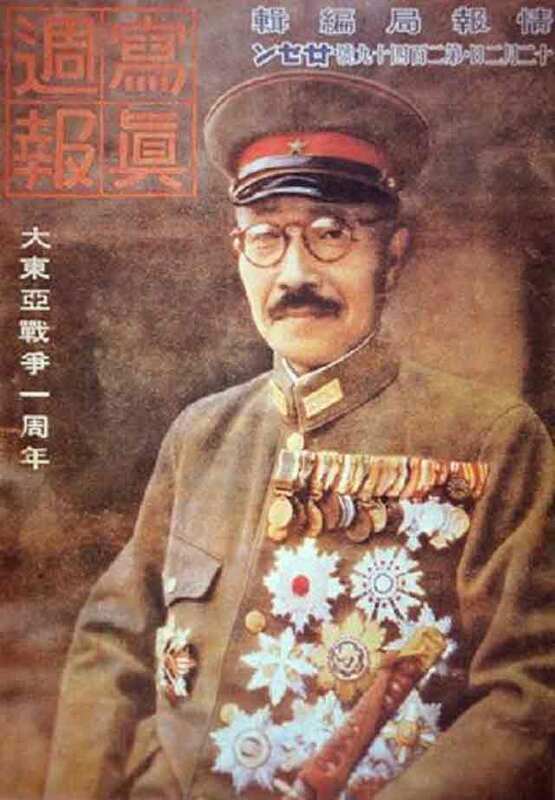 Thus, unlike the Soviet Union glorifying Stalin or Germany glorifying Hitler, the Japanese glorified a secondary leader, General Tojo. It just wasn't the same. 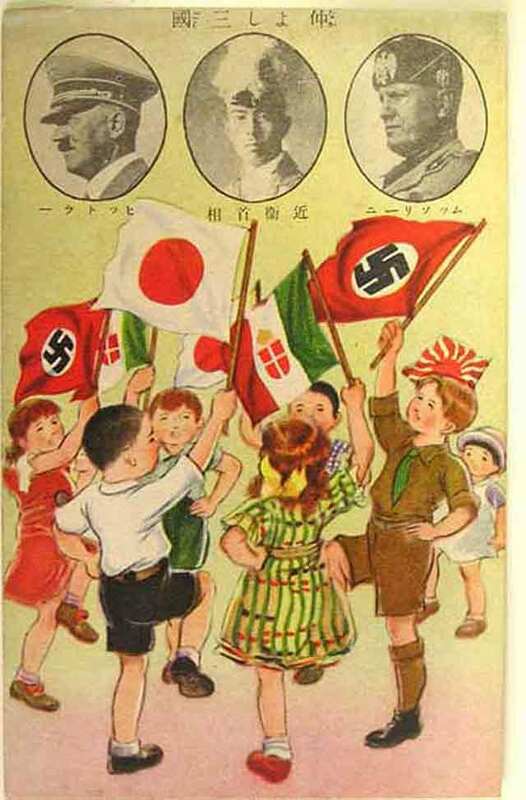 The best that the Japanese could do with Hirohito was to include a photo of the Emperor alongside those of the leaders of Japan's allies. This did reflect a common theme of wartime posters, that of unity with the nation's allies. Both sides portrayed the other's leaders as inhuman monsters. Here, President Roosevelt is made to resemble Frankenstein. Each of the warring nations not only glorified its own leader but also attacked and belittled the opposition's leader. 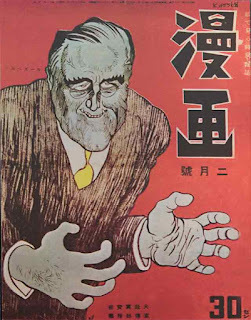 Above, a Japanese poster manages to make President Roosevelt look uncannily like Bela Lugosi. Creepy Roosevelt couldn't be allowed anywhere near Japan! 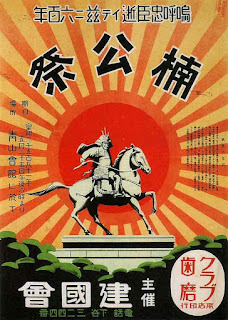 Another main theme of Japanese propaganda posters was national pride. 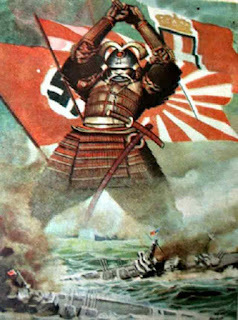 The posters artistically portrayed the Japanese as heroic warriors. Thus, references to Samurai were common. 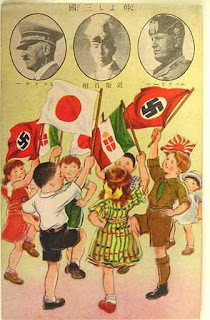 This glorification also extended to Japanese dominance in modern technology. 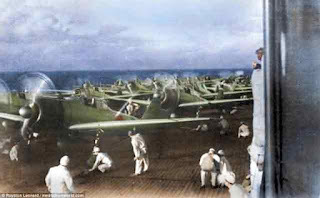 The Imperial Air Force and Navy were particular figures of pride. 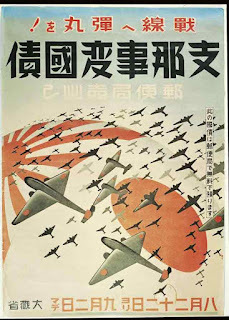 Japan often is portrayed in Japanese propaganda as dominating the air, and thus, the world. 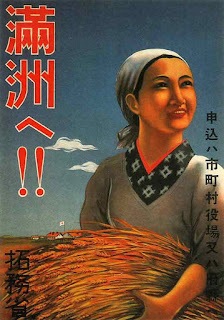 Thus, Japanese propaganda is a very curious mixture of historical Japanese heroic symbolism and cutting-edge imagery (for the 1940s). The Imperial Navy is often portrayed, out at sea guarding the home islands, as staffed by dedicated men. The theme is "pride in the armed forces." "Look at how strong we are!" is the subtext. 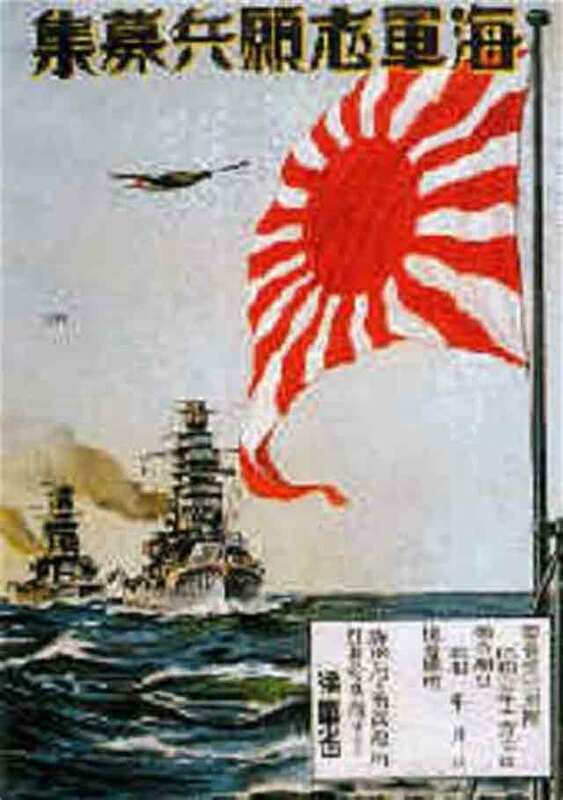 The themes echo those of World War I England and Japan, each showing their mighty navies as figures of national pride and security. 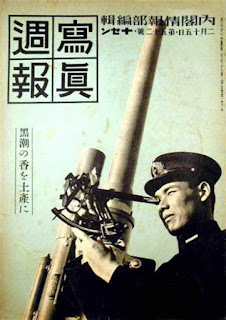 There is a heavy emphasis within Japanese propaganda on the Imperial Japanese Navy as being full of modern, sophisticated soldiers. The subtext is, "Look how smart and capable we are." 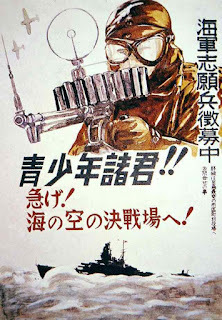 Curiously, the same emphasis is not placed on Imperial Japanese Army soldiers. Naturally, with the right equipment and such capable soldiers, victory would be inevitable. 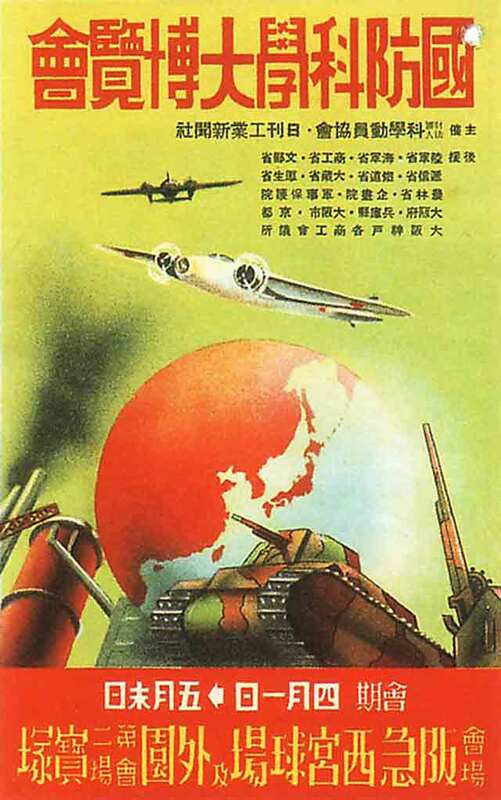 An image of the overpowering military might is conveyed, with massive bombers swooping out of the sky. Of course, the soldiers were fearless and completely devoted to the cause. 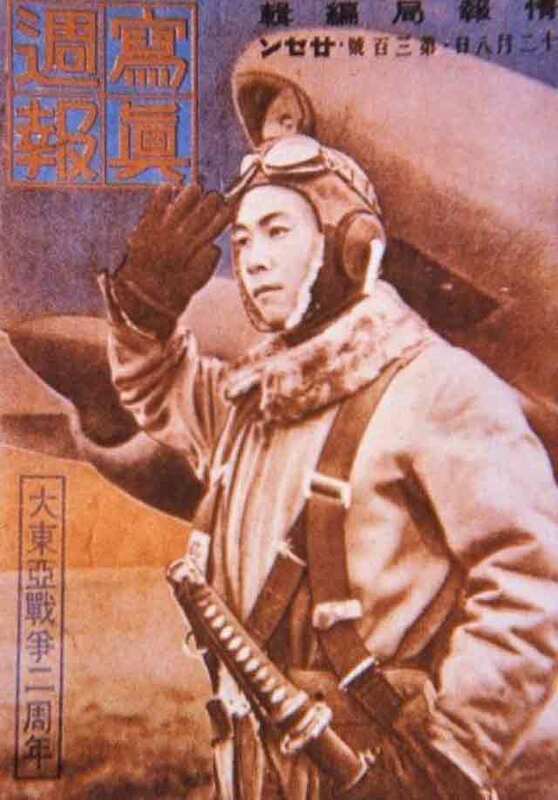 The poster above portrays a Kamikaze pilot off on a mission - his last one, of course. He is saluting and ready to do his duty. The traditional symbols of Japanese honor, such as a ceremonial sword, are included as if to say: it is your heritage to do your duty even if it is a one-way ride. Doing your duty included simply doing your own job, whatever it was. 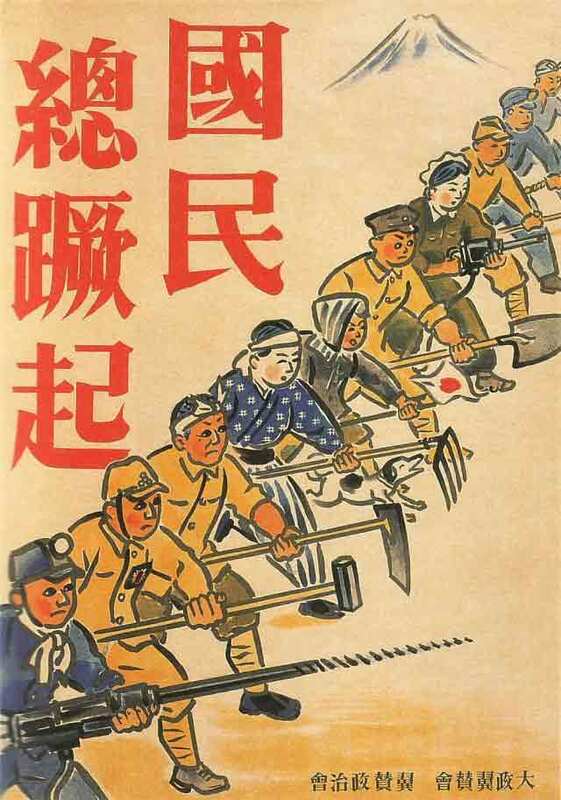 Happiness through ordinary work was a common theme. This would supply the government, portrayed in the distance in the above poster. 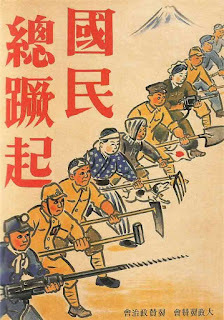 In the poster below, rakes and shovels are portrayed as just as important to victory as machine guns and rifles. 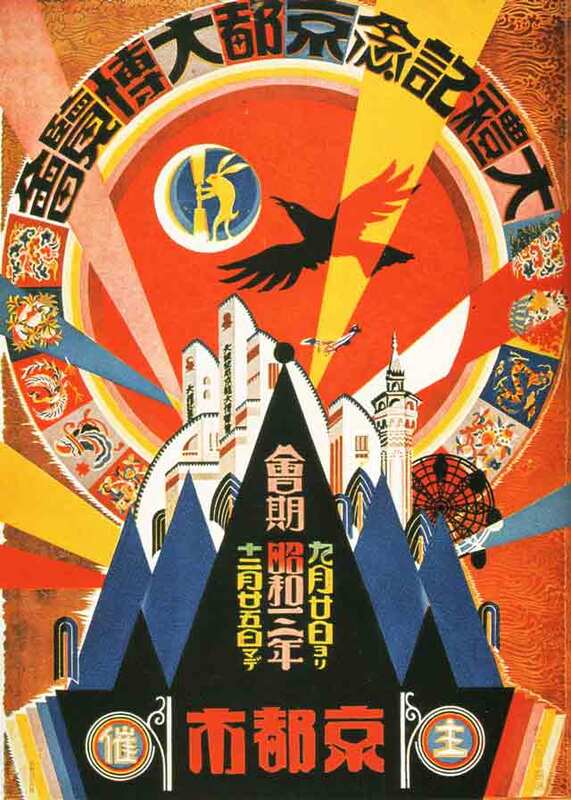 Other posters used these themes as subtexts when announcing various Expositions. What is unique about these posters is how beautiful and colorful they are. 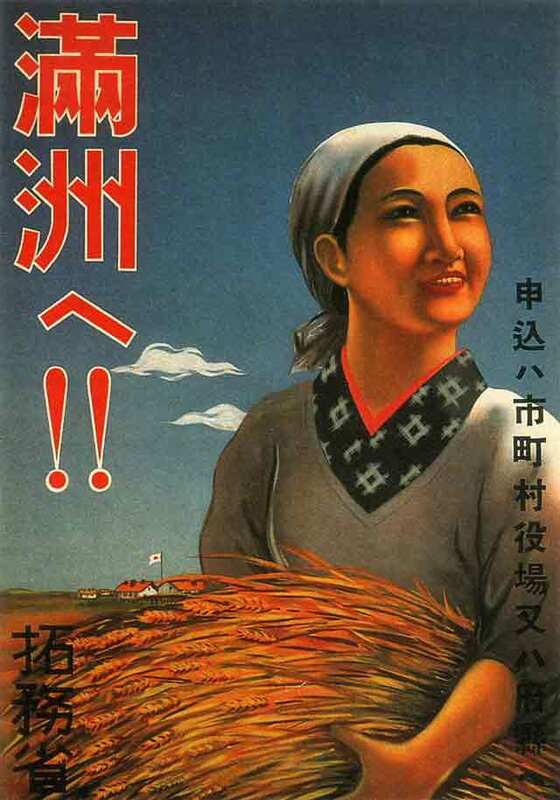 An image of modernity is conveyed that is absent from most other nations' posters. 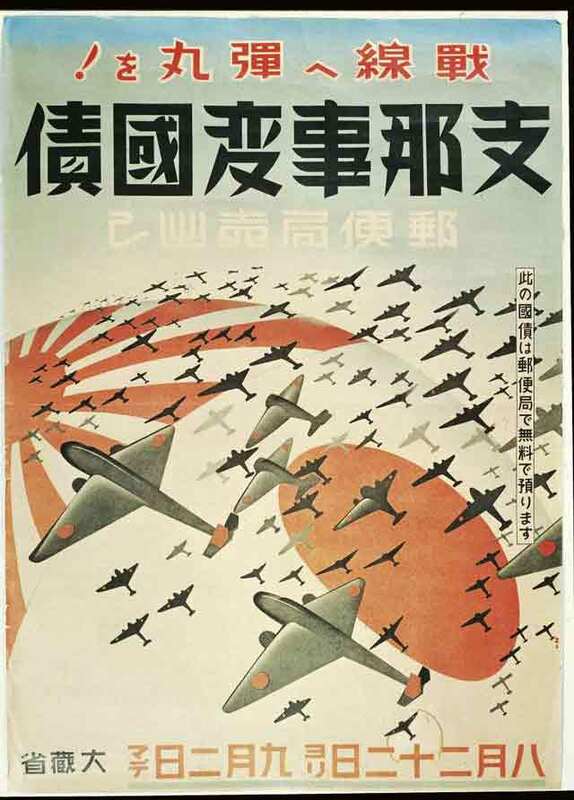 For instance, in the poster below, an airplane is juxtaposed against a modern city as if to say: our air force is cutting edge just like everything else that we do. 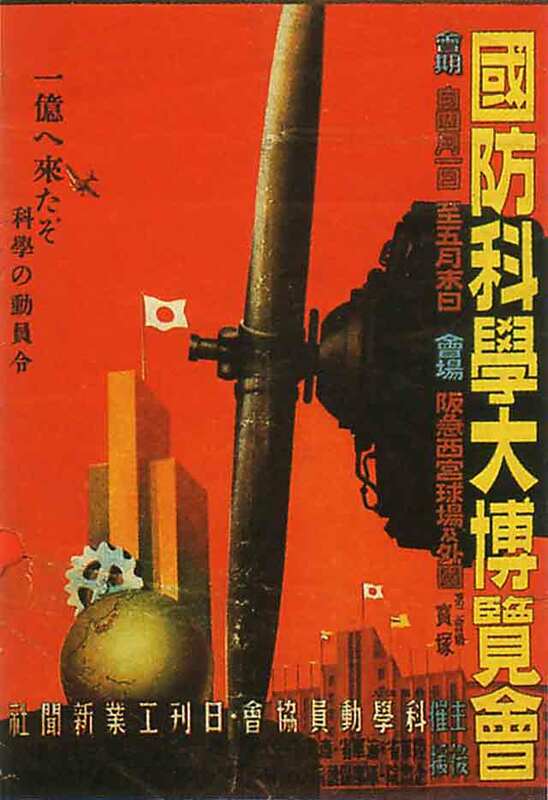 National Defense Science Exposition – Hyogo, 1941. 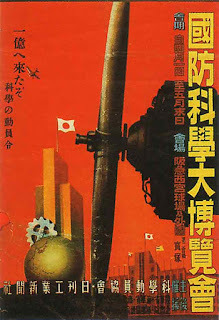 Naturally, the world is just Japan's plaything when subdued by such magnificent weapons. 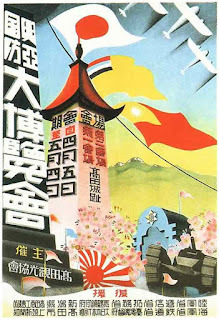 Above all, it is the Japanese homeland that is the center of the world, and it stands above all else. 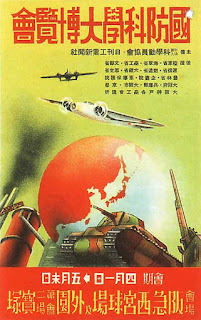 There really is some great artistry in the Japanese propaganda posters. If you can overlook the intent behind them, which as mobilizing the masses to support the war effort, they are beautiful works of art. What's it have to do with Imperial Japanese propaganda? Quit trying to center the world aroudn those six million. Japan lost 3 million, Germany - 10, the Union - 30 million. You're not the center of the world.